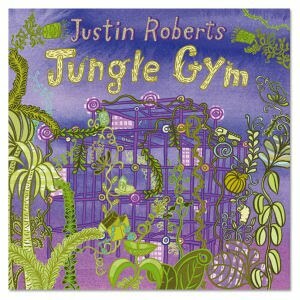 CD Review of Jungle Gym by Justin Roberts. Once upon a time I got a CD called Jungle Gym. It is Justin Roberts music. It was AWE-some. “Obsessed by Trucks” is about a brother who is very obsessed with trucks. Obsessed means really like it. If you don’t know what obsessed means, you can learn it from me--ADA GREY! There is a movie of it, and it is really funny. A girl is lip-synching “Obsessed by Trucks.” That is funny because it is a song Justin Roberts sings and not this girl. It is my favorite song Justin Roberts has done. I like cars but I am not obsessed with them. I like groovy things and “Obsessed by Trucks” is really groovy. There is this song “Sign My Cast.” It was about a guy who had a cast and he used to be the king of the jungle gym but then his arm got broken and now he can’t go on the jungle gym with his arms broken. It has very sad music. It has very slow music. It makes me feel sorry for the guy who got hurt. There is a song called “We Go Duck” and it was about the game Duck Duck Duck Goose. It makes me feel like I want to play it. It sounds like Justin Roberts is playing Duck Duck Goose. Because it is really fast, it seems like he is running around. Part of the song “Trick or Treat” was “tricker, tricker, tricker.” It was super good. It is groovy. It is amazing. It reminds me of trick-or-treating. It is fun because you get to dress up, like dress-up, only you get to dress up and go outside and get candy and stuff. He might like trick-or-treating still but he doesn’t do it—but maybe he does because some grown-ups go trick or treating. Like my mom—she dressed up as Batman for Halloween. This song was about sleepovers and he was going to stay up all night with his friend and they would play a lot. And at the end he was so sleepy that he had to stay in bed all day. Me and Aunt Amanda had a sleepover and listened to it. I think the sleepover would have been funner if I got to stay up all night. I stayed up a lot of the night last night. And you can go see him on stage. I went to go see him on stage on Sunday. It is really exciting. The music when you see him is louder. The music was really awesome. I thought it was like rock star music. It rained—it doesn’t rain on a CD! He did some songs which were not from Jungle Gym. My favorite song was “Obsessed by Trucks.” I sat down and sang with him. I actually sang pretty loud because I was so excited that they were doing “Obsessed by Trucks.” There is a guy who wears enormous sneakers. And they brang out ketchup so that’s why I think they were going to do “Meltdown,” and then it started raining so they couldn’t do it. There’s these funny puppets called Little Dave and Willy Whale. And Willy has a microphone—it is like a loopy microphone, so it goes like loop! and kind of close to your mouth. I wondered why they didn’t have a song about Little Dave. I’ve been to seventy-hundred concerts but I like to see Justin Roberts again and again. He is also my friend. I think Justin Roberts should have a song about home schooling because I go to home school. Most of his songs are about school because most kids go to school and he went to school. Maybe that is why he hasn’t done one about home schooling. I think it would be good because then other people would know what other people are doing. So my friends would know I am having fun at home school. And I think there should be a song called “Obsessed by Pickles.” And I think it should be the grandpa who is obsessed by pickles because my grandpa is obsessed by pickles. I wish that I had Justin Roberts videos to watch on the t.v. I think everyone would like this. I think grown-ups and kids and teenagers would like it. Do you like groovy things? It is really groovy. Most of his songs are about his childhood and his family. Me and my mom listen to it in the car a lot. This is the end of my review. See you next time at my next review. Bye. One day I got some music, and it was called Sock-A-Delic. 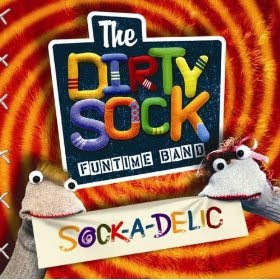 It was Dirty Sock Funtime Band music. This kind of music is hilarious and great. I like to make up dances about the songs. I like their kind of music a lot. I like other kinds of music too, like Justin Roberts and the Yeah Yeah Yeahs, but this is one of my favorites. There was one song called “The Bad Habit Boy.” I thought it would be called “Willy McWaste.” That was kind of strange because it says “Hi, I’m Willy. Willy McWaste,” and I thought it was going to be about Willy McWaste. I didn’t think it would be called “The Bad Habit Boy.” His bad habit is wasting things. The singing was funny and the music was good but not funny. It is a lesson that you learn: don’t waste everything like your money—or the most important thing: hope. There was a song called “Donut Brain Aliens.” It was about donut-brain aliens. Almost the whole beginning line is just “donuts,” but I like it anyway. It is hilarious because donut-brain aliens look kind of like donuts. I know because I saw a picture and their heads were kind of like donuts. I think they make donuts out of brains or something—I have no idea actually. It is funny and cool—great music, great lyrics, just a really great song. There was a different album called Genius Backpack and that had “Donut Brain Aliens.” The differences were that they had different beginnings. They have different movements in them. When I say movements I mean like how it sounds. One of them was slow and one was fast. And one of them starts out, “hey” and one of them starts out, “let me hear you say.” One of them wants you to dance and the other one doesn’t. The new one does. One of them says “stop” “so we can stop the donut brain aliens” and the other says “so we can dance like donut brain aliens.” I like the second version best. I think it is more groovy. And, after all, it is the newest one. In “Rage Against the Time Machine” a guy said, “hey, look at this. It’s a time machine.” A then someone else said, “Whoa, let’s set it for seven seconds into the past.” And seven seconds has passed already. And then it goes ahaaahaaaahaaaah. ‘Cause then like it goes over again—because seven seconds into the past is them saying it again. It was great awesome. It was a very good dancing song. In the car we laugh about it because it is so funny. Ernesto was a super hero who actually had a funny voice. Ernesto’s is a shopping place. You can buy capes and pirate costumes. They are very cheap. I like to dance “The Banana” while I listen to it. And a tv thing is called W-H-A-P—whap! The Ernesto’s song is like a commercial because it is about a store and it is telling you to go there. But it is not real. I wish it was real because then I could go there and always buy everything—like superhero toys and superhero movies. “Dream of the Clown” is about sleeping. Mr. Clown is just so funny. He goes to sleep in a funny way. The music is like what he says when he is sleeping. There was a song called. “I Love It!” I love it! I love it because it is so great, and that one is not really that funny. But I still like it. It teaches you what other people love. They said “Shout out what you love” and everyone had to shout out what they love. Friends! Family! Sweets! Paintings! Toys! Movies! My Mom says stuff like: Art! Ada! Dad! Green tea smoothies! Groovy girls! Movies! Everyone I think would like the CD. It is funny. It’s awesome. It has great lyrics. Put it on in the car, and put it on and dance. My mom smiles when it is on so I think she likes it. Me and my friend Nora had a dance party with this music. I think she liked it because she danced a lot and looked like she was having a lot of fun. 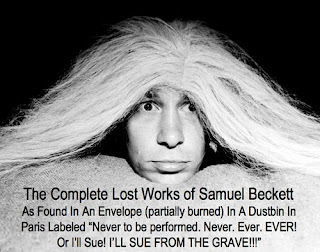 Once upon a time there was a play called The Complete Lost Works of Samuel Beckett and so on. It was super funny. “Table Talk” was really funny. The guy was holding a table because two of the legs were off. There was a glass of water—of rain. The brain on the table in a jar was like a boss, and he also bossed around his servant. I think the brain was telling the romance story to the servant so he would have something to listen to while he was holding the table. The actor was acting like the story was really happening to him because he was like “ahh eee ahhh.” I think that was water actually tipping from the glass that he decided to pour in his pants so it looked like he was peeing his pants. He was cleaning up the pee that he peed, and he lets go of the table. He was holding the table for no reason because it stays up when he lets go! Why was he getting him to hold the whole table if it was just for no reason!? “Happy Happy Bunny Visits Sad Sad Owl.” It was kind of funny because Sad Sad Owl said “somebody ate my cupcake” and then Happy Happy Bunny says, “who ate your cupcake?” “I ate my cupcake,” says Sad Sad Owl. It is funny because if he ate it, why would he be sobbing that he ate his cupcake? They were stuffed animals and not puppets—I thought that was really funny. All the things (a sign, a tree, a grass) go hopping with Happy Happy Bunny. It was awesome. “If” was the same thing (music and a man in a rocking chair dressed up like a lady) going over and over again. I kept thinking that he would stop. He kept saying “More” and then people would throw things at him. Someone dragged his chair offstage—it was someone from the audience that did that. Then Danny pulled the rocking chair out. I would have just went up there to the place where they were doing the music and say “Stop that music at once.” I didn’t because I felt the actors would get angry. I felt silly because it kept going over and over and over and over and over and over again. I felt like I was in the show. The show was awesomer than the music. There is a funny part in a letter where Greg said “P.S. Don’t dramatize this.” They weren’t dramatizing it—they were fun-i-tizing it. “Foot Falls Flatly” is about a dance; he starts dancing and he gets a broken leg and has to go in a dustbin. His costume was so silly. In “fragment,” Greg was talking and he said, “I begin as I have always begun. I switch ON! No, not good.” Then John did like a funny face or like another show or a smiley face. Then one time Greg said “I begin as I have always begun. I switch ON!” and then John does this rocking chair scene and he is like, “doo doo doo doooooo. Ahhhh!” “No no no! I switch off,” Greg says it. I think there should be girls in this play because then it would be even funner. But when I saw it, it was pretty fun as well. I think it should be rated for every age but 2 and 3 and 1. I don’t think the 2s could stand how long that rocking chair scene is. The brain on the table I think little kids would be scared. The peeing of the pants I think my friend Lana would think was really funny. We both really like comedy. I think people should come see the play every day. It is so fun!